Today's Internet has a large economic influence but is based on legacy mechanisms and algorithms from the 70ies and 80ies. New applications have high demands for which the original Internet architecture was not designed for. 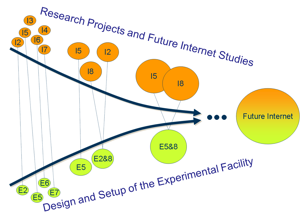 The goal of the G-Lab project is to foster experimentally driven research to exploit future internet technologies. The G-Lab project consists of a Germany-wide research and experimental facility used to investigate the interplay between new technologies and the requirements of emerging applications. The BMBF funded project consists of 32 partners. The first phase started in October 2008 with six partners and runs for three years. The second phase started in September 2009 and consists of nine additional research projects. The G-Lab testing facilities consist of wired and wireless hardware with over 170 nodes which are fully controllable by the G-Lab partners.